What the Swedes call Vision Zero and the Dutch call Sustainable Safety is an evidence-based mobility paradigm that focuses on designing fail-safe streets. It is primarily about infrastructure improvements, but it also entails the regulation of vehicles and the setting of appropriate speed limits. The Vision Zero paradigm is radically different from the old ‘Education, Enforcement and Engineering’ approach to road safety that still holds sway in North America, including cities like Toronto that are rebranding such programs as “Vision Zero.” A survey of traffic death and serious injury data indicates that a rigorous safe systems approach—real Vision Zero—is the only way to make our streets safe. Compared to Canada, Vision Zero countries like Sweden, Denmark and the Netherlands have about half the road violence and many times the rates of active mobility for people of all ages and abilities. It’s misleading to brand any education measures, and most if not all enforcement measures, as Vision Zero. Research over many decades has proven that educational campaigns—whether watch for cars or watch for kids, wear a helmet or don’t text and drive—rarely result in the desired behavioural change, and they certainly don’t protect us from reckless drivers. The city of Toronto could save money by dispensing with frivolities like ‘suggested speed’ signage, and focusing instead on fail-safe and evidence-based approaches to road safety. Enforcement can be useful in areas awaiting Vision Zero design solutions. It should be automated where possible, and it should focus on the instigators of road violence (e.g. drivers who are distracted or travelling at unsafe speeds) rather than on the vulnerable who pose no threat to others (e.g. children walking or cycling to school). In other words, let’s exercise due caution at both ends of the gun, at least for the two weeks when we know the police will be watching. In that description cyclists are only mentioned as a serious threat to pedestrians (which they practically never are), not as vulnerable road users in need of protection (which they always are). The idea of briefly “educating” and “paying special attention” to all road users is an insult to the victims of the carnage that will continue to plague Toronto until it embraces a viable road safety plan. We’ve heard a lot of talk from the Mayor. It has been almost two years since Tory made his commitment to zero traffic deaths by 2021—since, if you believe the spin, Toronto ‘adopted’ Vision Zero. Yet the incidence of road violence continues to rise. It has been almost a year since a change in provincial regulations allowed communities to install safety cameras for red lights and speeding in every community. Yet it’s only after the latest surge of deaths that we are beginning to hear promises of future camera “pilot projects” in an unspecified number of school zones. Mayor Tory’s safety camera “pilot” will have merit if it is implemented in all school zones—perhaps by changing the location of detection devices without warning, to keep drivers on their toes. But knowing the current administration we should anticipate a far more compromised solution that does not result in meaningful safety gains. In any case, Vision Zero is really not about the “big, fat tickets” that Tory is suddenly promising. The real challenge is in finding ways to design the conflict out of Toronto’s streets. The city’s latest road safety plan includes following Ottawa with the installation of mid-street flexi-posts later this year, in the avowed hope that they will calm school zone traffic. But why not put those posts in places that would create protection for cyclists, rather than pinch points? The implementation of a credible grid of protected lanes in every Toronto school zone would calm traffic by narrowing the lanes, and it would discourage the illegal stopping that has become a major problem during school drop-off and pick-up hours. While awaiting more robust infrastructure, such as concrete barriers and medians, one could install many thousands of flexi-post bike lane dividers for very little money. That added protection might require the removal of on-street parking in some areas, but this would be a small price to pay for safe active routes to school. 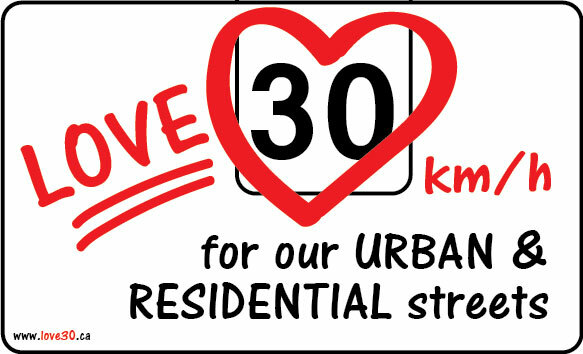 It’s also time to extend Toronto’s 30 km/h residential speed limits far beyond the downtown core. And the city needs to adopt a sensible hierarchy of modes for moving people, with priority given to healthy, sociable and space-efficient transit. In order of importance, Vancouver’s official mobility priorities are now: (1) walking; (2) cycling; (3) mass transit; (4) taxis / commercial transit / shared vehicles; and (5) private automobiles. Another city to watch is New York, which last year made substantial progress in the reduction of traffic violence, largely through the mass implementation of advance green lights for pedestrians. Those decisive, quick and cost-effective maneuvers are a step in the direction of the Netherlands, which has the world’s happiest children and drivers. That’s what you get when you design out the conflict and reclaim space for safe active mobility. Mayor Tory’s team is offering no such bold, 21st century mobility solutions. Instead, we see billions of dollars funneled into the rebuilding of antiquated urban freeways, including the six-lane highway dividing North York, where Tory wants to pay extra to avoid building a bike-friendly, ‘complete’ Yonge Street. There is relentless squabbling—sometimes lasting for years or even decades—every time someone wants to install a Toronto bike lane or sidewalk, often with no safety improvement in the end. And as we see with the latest announcement, too much of the city’s meagre road safety budget is squandered on pointless education, scattershot enforcement and vague assurances that the coming round of infrastructure tweaks will finally reduce the death count. This succession of false promises and half-measures is not serious road safety, and it’s certainly not Vision Zero. Toronto needs leaders who can tackle the epidemic of road violence and motor vehicle congestion with a bold, concerted, evidence-based approach. Toronto needs to learn from the cities that are achieving healthy and efficient mobility for all. 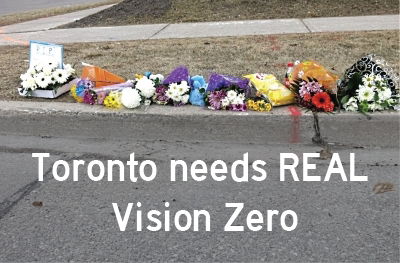 Toronto needs real Vision Zero. 6 awesome advocacy orgs are pushing #Toronto's muni candidates to commit to 15 #safestreets proposals. 2018 is far from over, yet the levels of #Toronto road violence are worse than in the year @JohnTory set his zero-deaths-in-five-years target. @jen_keesmaat has a plan to fix #TOdeadlystreets, and it's a very good one. 47 pedestrians & cyclists killed in #Toronto this year, so far. The worst since police began counting in 2007. And yet @JohnTory wants to double down on failing behavioural change campaigns. In June advocates released the superb #BuildtheVisionTO proposal—unheeded by the PWIC. This entry was posted in bike lanes, Canada, pedestrian safety, road safety, safe systems, shared responsibility, Toronto, traffic violence, Vision Zero on March 21, 2018 by grahamlarkin.